One fun part of preparing to add a child to our family through adoption is creating a physical space for him/her in our home. 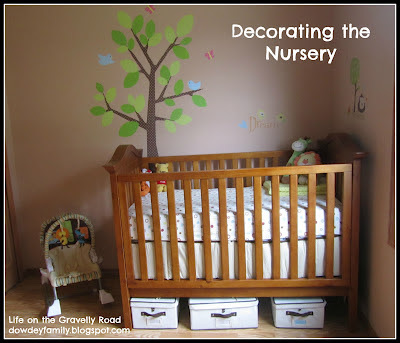 The nursery has been "in progress" for quite a while. Before we moved in, a lot of changes were done to the bedrooms upstairs, including the nursery -- in-floor heat, new flooring, paint, and lights. We've since set up the crib (mostly so we didn't misplace any pieces), added some cute wall decals (we loved using decals in our son's room so it was fun to find some for the nursery too), curtains and a new changing table. We still need to find a rug, upgrade the light to be a dimmable, move the glider upstairs and clean out the closet (it has been a collecting place for outgrown little boy clothes). I've moved the newborn and 0-3 month clothes bins into the closet for now and moved a few other baby items upstairs. There's still a lot to do and I'll update when/if we get further. I appreciate having a place in our home waiting for baby. It looks really cute! The tree is a really fun addition.